the National Basilica of Koekelberg, the fifth largest church in the world will be the setting for a one-off and exceptional concert! Two of the greatest masterpieces in the history of music : the Requiem of Mozart and the Ninth Symphony of Beethoven. 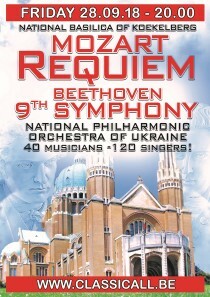 The 40 musicians of the prestigious Philharmonic Orchestra of Ukraine will brilliantly perform these monumental works during their European tour. And they will do so under the skilfully leading of Youri Yanko and accompanied by an inspirational choir of 12O singers! The Basilica will bathe in a splendiferous radiance as never before!